Winnipeg has long been recognized as a centre of great musical vitality. In the aftermath of the “Great War” there was a great demand in many North American cities for exposure to the best and the brightest of the world’s musicians, a demand greatly facilitated by improved rail transit systems. Many eminent performers appeared in Winnipeg in the early 1920s, including the English pianist Myra Hess, and Alfred Cortot of France. One of the most distinguished pianists to come to the city was the Russian, Sergei Rachmaninoff (1873-1943), who performed in 1923 and again in 1925. Rachmaninoff was not just a pianist, but a famous composer and conductor as well. During his second visit, one of his popular compositions led to a memorable meeting between the composer and the Band of the Princess Patricia’s Regiment. Just how Rachmaninoff came to be visiting North American cities in the 1920s as a concert pianist, has much todo with the seminal political events of 1917. 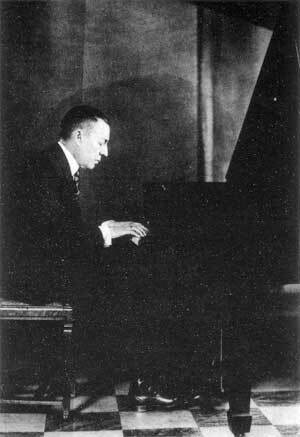 Rachmaninoff at the piano, circa 1930. When playing in public the Russian composer generally imparted an image of severe austerity. This would not be the great Russian’s last visit to Canada, but at the time, it is unlikely that he entertained any notion of returning to North America again. The reason is that Rachmaninoff was a man of strong domestic inclinations. Although the 1909 tour was necessary for his career, he did not enjoy being out of his native Russia. In a letter from New York to his cousin, Zoya Pribitkova, he complained that “I am very busy and very tired. Here is my perpetual prayer: God give me strength and patience.” It was not that he was ill-treated. “Everyone treats me nicely and kindly, but I am horribly bored with it all.” He confided to her of being in “this accursed country” and surrounded by nothing but the “business business” and trapped in a place where “they are forever doing, clutching you from all sides and driving you on.”  As one of the leading luminaries of Russian cultural life, he yearned to rejoin his own world, one which was, in most respects, his to command, and which would remain so until the political crisis of 1917. Rachmaninoff’s ability to pursue his musical destiny from an advantaged position within the borders of his own country ended in that year. 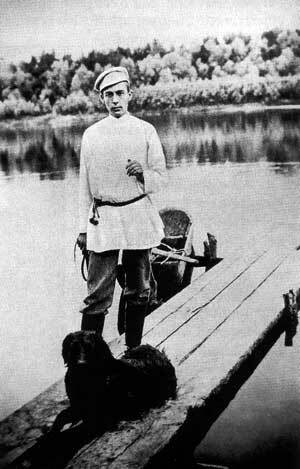 Rachmaninoff as a young man at the family estate “Ivnanovka” near the Ukrainian border. 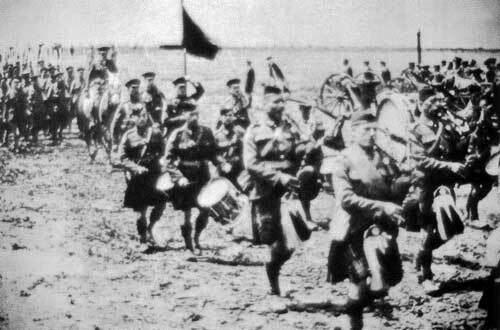 Pipers of the Princess Patricia’s Canadian Infantry in France, 1918. 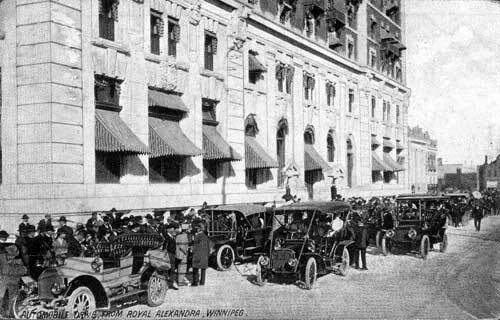 Royal Alexandra Hotel, Winnipeg, circa 1910. Opened in 1906, the Royal Alexandra served as one of the main luxury hotels in the city until its closing in 1967. The hotel was known for its large rotunda, Challenger murals, tea room, Crystal Ball Room, and vice-regal suite. The Royal Alexandra was demolished in 1971. World War I had touched every one in Europe and North America in different ways. When the Norwegian steamer, Bergensfjord, shipped out of Oslo on 1 November of 1918, it sailed into an ocean still blacked-out by War. On November 10, the ship arrived in New York City. The Rachmaninoffs were on board. It was perhaps the best day upon which to arrive and make a new beginning in North America, for the following day the armistice was declared, to the relief of all. Among those waging war in Europe there was one unit which greatly deserved the rest promised by the armistice: that was the Canadian Princess Patricia’s, a regiment which had been in the field since late 1914. Upon the regiment’s return to Canada in 1919, the military leadership decided that the name of the unit should be preserved as part of the Canadian permanent field force. As part of the consolidation the regiment’s band was put on a solid footing with the appointment of Captain T. W. James, a former bandmaster of the Scots Guards, as Director. “Musicians who had served through the great war with various British and Colonial regiments signified their desire to join, and within a short time the nucleus of the present band was organized.”  The regiment was assigned to the Osborne Barracks in Winnipeg, and from this base the band made many tours of western Canada and elsewhere, performing in parks, theatres and at local exhibitions. From its beginnings as pipers in the trenches, the Princess Pat’s Band gradually transformed itself in the post-war years into something much more than a “wind” ensemble. “It is truly an orchestra, with the splendid tonal qualities, the balance, the rhythmic sense and the artistic sensitiveness of a first-class orchestra.” Its repertoire was orchestral although it also developed arrangements and programmes which would cater “to the tastes of all types of audience.”  Like Rachmaninoff, the band became itinerant in the 1920s. In the band’s repertoire was an arrangement of the Russian master’s very popular Prelude in C# minor. In time the paths of the band and the great pianist would cross. In 1918 Rachmaninoff had, somewhat surprisingly, decided to take up the rigorous life of a concert pianist, rather than the more settled life of a conductor. In doing so he had to curtail his efforts in composition at a time when he was in the very prime of life. It was only in the later 1920s that he made some effort to pick up the pieces of his compositional career. The result was that in the first decade of his life in exile many people in North America and Europe were able to hear Rachmaninoff, the great pianist, perform on a fairly regular basis. Canada was not excluded from his tours and in 1923 and 1925 the citizens of Winnipeg welcomed the virtuoso to local concert halls. 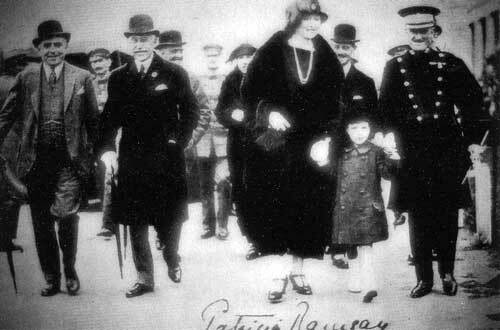 Princess Patricia (Lady Ramsey) with the Duke of Connaught and Capt. T. W. James, Director of the Princess Pat’s Band at Wembley, England in 1924. Sir Henry Thornton, newly appointed president of the recently consolidated public Canadian National Railway system, was an innovator. In July, 1923 he initiated the use of radio for railway patrons and staff. By 1924, a system of radio stations had been strung together for the benefit of passengers and anybody who could pick up the signal. Music, news, stock market reports, children’s travel tales, and hockey provided the main ingredients of programming. The CPR followed suit. When the Princess Patricia’s Band returned from its successful 1924 tour of England, both of the flagship Winnipeg hotels had become important centres of broadcasting. Station CNRW operated on the seventh floor of the Fort Garry Hotel. “The acoustic properties of this room lend themselves splendidly to microphone transmission.”  The well-appointed Crystal Ball Room in the Royal Alexandra Hotel was also set aside for radio broadcasting. By the time Rachmaninoff made his second visit to Winnipeg, the pitfalls of hotel radio broadcasting had been ironed out. 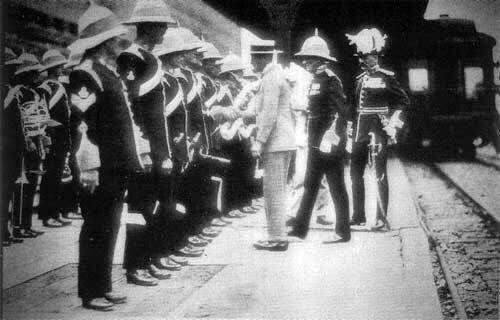 The Prince of Wales inspecting the Princess Pat’s Band at the CPR Station in Winnipeg, 1920. For his second concert in the city in March, 1925, Rachmaninoff performed at another of the favoured recital locations in 1920s Winnipeg, the Central Congregational Church. His programme again stressed the romantics, Chopin, Schumann and Liszt. In her review of the concert, Mary Manners speculated that there “seemed to be some kinship between Liszt and Rachmaninoff.”  Her intuition was valid. Rachmaninoff had been taught advanced piano by his cousin, Alexander Siloti, a talented professor of music at the Moscow Conservatory, and one of Liszt’s favourite pupils. Rachmaninoff was naturally required to play his famous Prelude in C# minor. A note on the history of this compelling piece is in order. It is quite a mistake to assume that Rachmaninoff hates it. He thinks it is a very good piece of work. What troubles him is the fact that he is expected to play it every time he is seen near a piano. That same year, Rachmaninoff encountered the Odessa-born pianist, Benno Moiseiwitsch, a great champion of his music, and a fellow émigré to America. Moiseiwitsch related the contents of a letter he had received from one of Rachmaninoff’s admirers. In this letter, the writer had speculated on the meaning of the famous Prelude. Does it, she asked, “describe the agonies of a man having been nailed down in a coffin while still alive?” To his compatriot Rachmaninoff wryly responded that if the Prelude “conjures up a certain picture in her mind than I would not disillusion her.”  Rachmaninoff was actually capable of taking some pleasure from any new and fresh performance of the work, such as the occasion in 1932 when he heard a rendition of it arranged for jazz band by the American, Ferde Grofe, the composer of the Grand Canyon Suite. This openness to other treatments of the piece may help explain his response to a special request during his 1925 visit to Winnipeg. Princess Pat’s Band assembled in the Crystal Ball Room of the Royal Alexandra Hotel, 1924. Rachmaninoff had been maintaining a rigorous concert schedule for seven years, and the year 1925 marked another watershed in his career. While he would not cease giving concerts over the remaining years of his life, he was anxious to take a “sabbatical” and pick up the threads of his composing. By December of 1925 he had begun work on his Piano Concerto No. 4 (Op. 40). He cut short the bookings for 1925-26. His output would not be extensive between 1926 and his death in 1943, but the late works were significant, highly polished and—to the irritation of many critics—very successful with the public. 1. Manitoba Free Press, 13 January 1923; 20 January 1923. 2. Cited in Sergei Bertensson and Jay Leyda, with the assistance of Sophia Satina Sergei Rachmaninoff, A Lifetime in Music (New York: New York University Press, 1956), p. 165. 3. On Rachmaninoff’s perfectionism, see Abram Chasins, ‘As I Saw Rachmaninoff: An Essay’ included in the RCA release of Rachmaninoff’s performances of his own four concertos in 1955. See also, Abram Chasins, ‘The Rachmaninoff Legacy - I.’ Saturday Review (29 October 1955), 37-39. 4. Bertensson and Leyda (1956), p. 163. 6. A moderate and balanced exposition of this whig interpretation of Russian history is that of B. H. Sumner, Peter the Great and the Emergence of Russia (London: English Universities Press, 1951). Soviet scholars have also been interested in this view. See N. Pirumova et al. Russia and the West: 19th Century. (Moscow: Progress Publishers, 1990). 7. Nicholas V. Riasnovsky, A History of Russia (New York: Oxford University Press, 1963), pp. 497-502. 8. The literature on the revolution and its implications is large. A review with bibliography at the time of the collapse of the Soviet Union is to be found in John M. Thompson, Revolutionary Russian, 1917. 2nd Ed. (New York: MacMillan, 1989.). 9. Glebe Struve, ‘The Cultural Renaissance’ in T. G. Stavrou, ed. Russia Under the Last Tsar (Minneapolis: University of Minnesota Press, 1971), pp. 179-201. 10. On the manner in which Russia attempted to modernize its economy in the later nineteenth century, see Theodore Von Laue, ‘Problems of Industrialization’ in T. G. Stavrou, ed. Russia Under the Last Tsar (Minneapolis: University of Minnesota Press, 1969), 117-53. 11. Phyllis Hartnoll, The Theatre: A Concise History 3rd ed. (London: Thames and Hudson, 1998), p. 222; for a review of the effects of the 1861 decree and the reforms of 1905, see Gerald Tanquary Robinson, Rural Russia Under the Old Regime (Berkeley and Los Angeles: University of California Press, 1967), Chapters 5 and 10. 12. Bertensson and Leyda (1956), p. 137; Robert Walker, Rachmaninoff his life and times (Neptune City: Paganiniana Publications, 1981), p. 59. 13. Suzanne Massie, Land of the Firebird: The Beauty of Old Russia (New York: Simon and Schuster, 1980), pp. 424-27. 14. Ibid. pp. 401-5; Hartnoll (1998), p. 214 f.
15. Riasnovsky, (1963), pp. 468-502. 16. Michael Ignatieff, The Russian Album (Toronto: Penguin, 1987) p. 18. 17. Bertensson and Leyda, (1956), pp. 75-207. 18. F. W. Gaisberg, ‘The Last of the Three Giants of the Volga has Departed’ Gramophone (May, 1943), 37-8; Chaliapin: An Autobiography as told to Maxim Gorky (New York: Stein and Day, 1967), pp. 128, 277-79. 19. Dan Levin, Stormy Petrel: The Life and Work of Maxim Gorky (New York: Schocken, 1986); Richard Hare, Maxim Gorky: Romantic Realist and Conservative Revolutionary (London: Oxford University Press, 1962). 20. On Feb. 2, 1905, Rachmaninoff was one of thirty-two musicians who had signed and published a public declaration urging government reforms, in the spirit of the general agitation of that year. See Bertensson and Leyda (1956), pp. 110-11. 21. Rachmaninof s Recollections. Told to Oscar Von Riesemann (1934). Translated from the German by Dolly Rutherford (Freeport: Books for Libraries Press, 1970), p. 185. 22. Rachmaninoff s Recollections (1934), p. 187. 23. Bertensson and Leyda (1956), p. 212. 24. Bertensson and Layda (1956), pp. 207-13. 25. Jeffery Williams, Princess Patricia’s Canadian Light Infantry, 2nd ed. (London: Leo Cooper/Secker &Warburg, 1985), pp. 2-3. 27. Ibid., pp. 7-31; G.R. Stevens, Princess Patricia’s Canadian Light Infantry, 1919-1957 Vol. 1 (Griesbach, Alberta: Historical Committee of the Regiment, 1923). 28. The Band of Princess Patricia’s Canadian Light Infantry (Canadian Pacific Broadcasts, 1925), p. 10. 29. W. T. Smith and J. A. Mackie, ‘Regimental Band - A Brief History’ The Patrician 26 (1973), 125. 30. The Band of Princess Patricia’s Canadian Light Infantry (1925), p. 14; Williams (1985), p. 30. 31. Williams (1985), p. 32 f.
32. The Band of the Princess Patricia’s Infantry (1925), p. 4. 34. Manitoba Free Press, 17 February 1923. 35. Manitoba Free Press, 10 February 1923. 36. Manitoba Free Press, 10 February 1923; 17 February 1923; 20 February 1923. 37. Manitoba Free Press, 20 February 1923. 38. Museum of the Regiments, Calgary. Princess Patricia’s Regiment Archives. Box 18-1 (Regimental Band), File 18 (75)-1. Typescript. p. 1. 39. The Band of Princess Patricia’s Canadian Light Infantry (1925), p.6. 40. See Harold D. Kalman, The Railway Hotels and the Development of the Chateau Style in Canada. Maltwood Museum, Studies in Architectural History, No. 1 (Victoria: University of Victoria, 1968); Cyndi Smith, Jasper Park Lodge (Altona: D. W. Friesen, 1985); Terry Reksten, Rattenbury (Victoria: Sono Nis Press, 1978). 41. Kalman (1968), p. 21. 42. Alan Artibise, Winnipeg: An Illustrated History (Toronto: James Lorimer/National Museum of Man/National Museum of Civilization, 1977), p. 136; R. R. Rostecki, The Historic Architecture of Winnipeg, 1880-1920 (Winnipeg: 1972). 43. Artibise (1977), p. 62. 44. Donald MacKay, The People’s Railway: A History of Canadian National (Vancouver: Douglas and Maclntyre, 1992), pp. 55-7. 45. Manitoba Free Press, 7 February 1925, p. 20. 47. The Band of Princess Patricia’s Canadian Light Infantry (1925). 48. Manitoba Free Press, 5 March 1925. 49. Bertensson and Leyda (1956), p. 7. 50. Rachmaninoff’s Recollections (1934) pp. 90-1, 110. 51. Rachmaninoff’s Recollections, (1934), p. 193. 52. Cited in Bertensson and Leyda, (1956), p. 133. 55. Rachmaninoff’s Recollections (1934), pp. 20-23; Robert Walker, Rachmaninoff, his life and times (Neptune City: Paganiniana Publications, 1981), 3-7. 56. Walker (1981), p. 76 f. Bertensson and Leyda (1956), p. 189 f.
57. Museum of the Regiments. Calgary. Princess Patricia’s Canadian Regiment Archives. Box 18-1 (Regimental Band). File. 18 (75)-1. Typescript. In the later 1920s, Rachmaninoff articulated his reservations about the value of radio broadcasts but appears to have altered his view when confronted with the success which radio demonstrably achieved in bringing good music to the people. See Bertensson and Leyda (1956), pp. 255-56. 58. Museum of the Regiments. Typescript. 59. Bertensson and Leyda (1956), p. 244. 60. An important bibliography on Rachmaninoff’s music, work and biography, which includes the extensive Russian language contributions, is Robert Palmieri’s, Sergei Vasil’evich Rachmaninoff A Guide to Research (New York: Garland Publishing, 1985). 61. Bertensson and Leyda (1956), pp. 167, 189. 62. Walker (1981), pp. 73-5, 113; Bertensson and Leyda (1956), p. 185. 63. Bertensson and Leyda (1956), p. 215; Walker (1981), pp. 89-94. 64. Walker (1981), pp. 90-3; Wayne Stahnke, ‘A New Method of Playing Music Roles’ Liner Notes to: A Window In Time: Rachmaninoff performs his solo piano works. Telarc. CD-80489. 1998. 65. Bertensson and Leyda (1956). 66. Cited in Michael Steinberg, ‘Nobility of Mind and Spirit’ Liner Notes to: Sergei Rachmaninoff: Great Pianists of the 20th Century. Philips. CD 456 943-2. 1998. 67. Manitoba Free Press, 17 February 1923.